Although you could fault the Mets and Omar Minaya on several fronts this offseason, one of the biggest glaring holes in the acquisitions was at starting pitcher. You could say that they should have gotten another first baseman or catcher. Personally, I think they’re fine at catcher. But I have been consistent in calling for a change at first base. Mostly, I hear from fans that the starting rotation is still a mess. Even Darryl Strawberry doesn’t like what the Mets have done, or haven’t done, this offseason. Now that we’re only two weeks away from pitchers and catchers reporting to Port St. Lucie, you have to consider the Mets picking up a leftover starting pitcher. The obvious choices are Jerrod Washburn, Chien-Ming Wang, and Erik Bedard. At this point in the offseason there are pretty slim pickin’s. You could always throw in Pedro Martinez, but I doubt that the Mets would go back to him. I wouldn’t either. He was better than I thought he would be with the Phillies last year at 5-1 3.63 in 9 games. But that’s a really small sample. If you consider the fact that he effectively robbed the Mets of two and a half years of his contract, I can’t see the Mets going there again. Bedard had surgery for a torn labrum and won’t be ready to start the season. Wang also has several months to go before he’ll be ready for the season too. But both pitchers have proven to be effective when healthy and neither is too old to make a comeback. The Mets should take a flyer on Bedard or Wang with an incentive laden deal. Washburn is looking old at 35, even for a soft-tossing lefty. With such limited options, the Mets need to take a gamble on Bedard or Wang. SI.com – Tom Verducci wrote an article comparing the 80’s and 90’s days of Doc Gooden and Darryl Strawberry to the steroid users. It’s hard to follow the premise that the off field activities that got Doc and Darryl into trouble are comparable to using performance enhancing drugs. But it’s worth a read. CBS Sports – The Brooklyn Cyclones are ending their stadium naming deal with KeySpan Energy. KeySpan was taken over and the company name doesn’t exist anymore. The original deal was supposed to run until 2020, so I wonder how much KeySpan had to pay the Cyclones to buy the rest of the deal out. NY Post – The Mets signed Long Island native Frank Catalanotto to a minor league deal. He’s not a bad offensive player but at 35 years-old it’s hard to imagine how much of an impact he’ll have in the big leagues anymore. I imagine he was signed to be a draw at Triple-A Buffalo more than he was to be in Queens. NY Post – Kevin Kernan did a good piece on Greg Jeffries. He was such an enigma with the Mets, coming up to a lot of fanfare in ‘87 only to prove that he was an average and immature player. 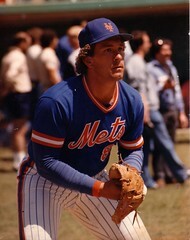 Daily News – The active career leader in minor league home runs, Mike Hessman, signed a minor league deal with the Mets. Again, I think this is a move to try to improve the miserable Bisons team. Daily News – Bill Madden details the laundry list of moves that Omar Minaya should have made this offseason. The funny thing is, that it’s nothing that you haven’t seen written anywhere else over the past two months. Madden needs to work on some original material. The biggest news this week is that the Mets finally announced the election of Doc Gooden, Darryl Strawberry, Frank Cashen, and Davey Johnson into the team Hall of Fame. They’ll go in on August 1 and that’s a date to mark on your calendar to be at Citi Field. It still burns me up that the team seemed to forget about the Hall of Fame, not electing anyone since 2002. You can see the entire list here. How is Johnny Franco not in the Hall? On the same note, Remembering Shea has a good list of the nine greatest Mets, the next nine to go into the Hall, and the next nine to have their numbers retired. It’s a great post. Take a few minutes to read it. The lists are great but I’m not as high on Jerry Koosman. I’d move him down a few spots, but other than that the lists are spot on. The Mets are holding a voluntary mini-camp in Port St. Lucie starting on Monday. It’ll be really interesting to see who shows up to that. There should be an announcement within the next day or so about which players will be there. If Oliver Perez doesn’t show up, I’ll be livid. Nobody needs the extra work more than he does. Things are finally starting to heat up this offseason for the Mets. Jason Bay is in the house and due to be introduced tomorrow at a press conference. But that’s not the only action going on after a slow start for the Mets. Talk back in the comments below about the Castillo for Lowell trade. I like it. Although I think that I’d like any trade that moves Castillo at this point. Lowell could be a nice platoon at first base and we know he’s a solid citizen in the clubhouse who has overcome a lot in his life.